Hello! I just started playing around with the gen 1 disassembly a couple days ago. Been learning a lot by reading through everyone's topics! I'm working with ShantyTown's Expand Dex hack. There are some things I'm trying to figure out... Would love any pointers! 2. I'm bewildered by how to make the mon_palettes.asm and other scripted palletes show in an emulator. I tried a bunch of DMG palletes in Gambatte Qt, but they don't show (for example) the individual Pokemon color palletes like the emulator in Stadium. Instead, it just uses a general pallete (like Squirtle and Pikachu are both blue in color or both red). This appears to shift objects along with it. Entering battle or menus does not correct it, but saving and resetting the save file does. Not sure if this is in the expand-dex version of pokered or something I caused, but am wondering if anyone knows where I might find problematic code? I compared the special_warps.asm file with one from a fresh copy of the Pokered disassembly and didn't see any differences in the code. 4. Lots of audio glitches. Is this normal for the expand-dex? 5. Houndour was caught knowing Selfdestruct, but I didn't see that move anywhere in its learnset. I caught it at level 19 on route 8. I thought maybe this was caused by new moves being in the learnset but not coded in, but Houndour isn't coded to know any new moves at that level (from looking at the evos_moves and base stats files). Anyone know where Selfdestruct is coming from? 'LD HL,[SP+e8]' is obsolete, use 'LD HL,SP+e8' instead. So I went in and fixed all of these according to instruction, and then I got an error that it didn't like 'e8' Anyone know what the deal is with this? Should I just fix the JP HL ones and leave the LD HL,SP+e8 alone? What even is this? Maybe it's causing some of these aforementioned glitches? Thank you to everyone who contributes to this forum and game. I look forward to getting better with code. 2. You need to run the game in SGB mode. Check if your emulator has something for that. Also you should link your code, otherwise people can't really know what's going wrong. expand-dex is outdated, and you're trying to build it with the current version of rgbds. You need v0.2.5 if you want to build expand-dex (I think). The things you deleted were supposed to be there, it's just that current rgbds doesn't support negatives like that and switched to something called Unions. Since expand-dex is outdated, it still uses the old notation for things. You will probably fix a lot of these errors if you put those lines back that you removed, and switch to using the right version of rgbds. Thank you, Ammako! I'll look for SGB mode. Exactly what I needed to know! I still need to figure out to use github repositories. As of now all my code is local. Oohmygosh, and thank you both. Great to knw about rgbds! 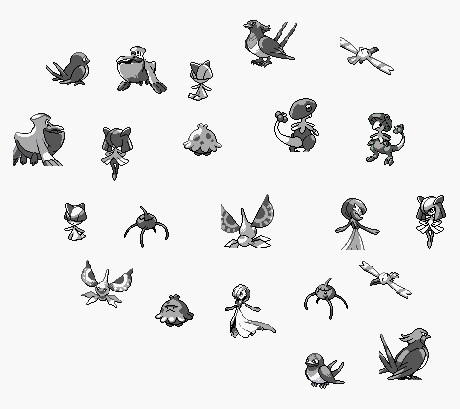 I started adding more pokemon the expand-dex (got taillow-pelipper) but had trouble at Ralts. Maybe it'll fix that too. I found a way to quickly devamp sprites (did these each in under a minute). I'm going to redo these though, make them look better before using uploading them to a repository. Not sure if this is new or anything, the only guide I found said they get blurry when devamped. These retainrf pixelation when resized. Just manually fixed a few displaced pixels. YEEESS! Everything works great now! I switched to an emulator with SGB and can see all the pretty colors. Installed rgbds v0.2.5 and reinstalled the expand-dex, so far so good. No audio glitches. Going to play around and see about the other glitches (and see if it fixes the problem I was having adding Ralts). I wanted to contrbute to the expand-dex and get the other Pokemon added. Should I use ShantyTown's repository or make my own? I'm going to continue editing locally for a little while just to make sure I got the hang of it first. It appears the fly glitch is still in, maybe I'll know how to fix that some day if no one knows here. Successfully added Ralts' line, though! What's the best way to test ROMs? I was using save files and save states, but they keep getting corrupted (is that normal?). I tried using cheats, but it's kind of a pain to go through the whole intro and getting your pokemon. If you're testing the Pokémon themselves, it can probably be a good idea to temporarily replace the Potion in the PC with a few Master Balls, and changing the Pokémon in Route 1 with the ones you're trying to test. :p Just don't forget to change it back afterwards. I tried committing changes to Mateo's expand-dex branch today to add Taillow-Medicham. I'm guessing it creates some kind of pull request that can be accepted/declined? It seemed to include some files that had nothing to do with the added Pokemon, so I'm a bit bewildered by that. Some were the Wild Pokemon files, which I did edit at one point, but changed back by duplicating it over from a Pokered backup. My branch isn't even the main one for that, ShantyTown has the master branch on expand-dex so any pull requests should be sent to him. Got it! Will do that with his. I originally grabbed the files from your branch, wasn't sure which one to put them in. Thank you!